Guard Jeremy Lin has played for four teams in five NBA seasons. The Charlotte Hornets entered free agency with perimeter needs but precious little cap space to play with, but on the eve of the NBA lifting its free-agent moratorium, the franchise was able to add a piece — a well-known piece. The Hornets agreed to a two-year deal worth at least $4 million with free-agent guard Jeremy Lin, according to Yahoo! Sports. Lin announced the deal on his Instagram. "Going into my first true free agency as an NBA player this off-season, the one thing that mattered to me the most was finding a team that would be a good fit for me. I wanted to be on a team where I would be able to play freely and truly play the game I love with joy again," Lin wrote on his Facebook page. "That has always been the most important thing to me. After a LOT of prayer and long discussions with family and friends, I wanted to personally let you guys know I’ll be joining the Charlotte Hornets." 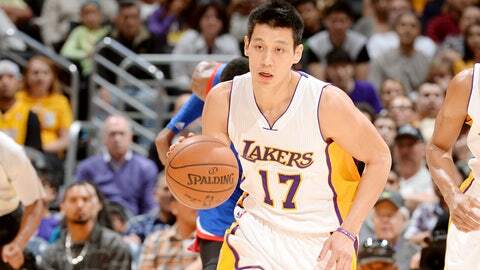 Charlotte will be Lin’s fifth team in six NBA seasons, following a difficult stint with the Los Angeles Lakers. He averaged 11.2 points and 4.6 assists per game as a part-time starter in L.A., but posted a career-low defensive rating. However, perhaps most importantly for a Hornets team desperate to land outside shooting, Lin shot a career-high 36.9 percent from 3-point range last season and has improved his outside shooting for five straight seasons. "We are excited to add Jeremy Lin to our lineup," Hornets general manager Rich Cho said in a statement. "He is a talented player who we feel can make significant contributions to our basketball team." The 26-year-old likely will step into a reserve role behind Hornets starter Kemba Walker. While the Harvard product has been unable to capture his "Linsanity"-level production from his out-of-nowhere 2011-12 run with the Knicks, he’s averaging 11.2 points and 4.8 assists per game over the course of his career — serviceable numbers for a backup guard returning to the Eastern Conference.